Okay. I've been in love with glass nails since I first saw them on the Jill and Lover's Instagram ages ago. But I have never been able to find cellophane on Kauai, and I couldn't find one I liked online. And anyway, who needs that much of it? So I haven't been able to try the look out, until I found some glass nail paper on Jolse! 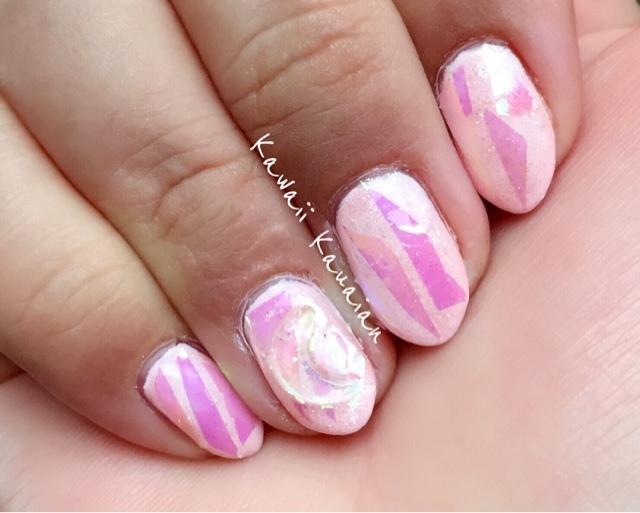 FINALLY I am able to do glass nails! YAY! I wanted a soft pink look, so I went with a baby pink and put a sheer glitter over it (which you can't really see in this picture) before laying on the cellophane. It was a lot thinner than I thought it would be, and it stuck to the nail much better than I had hoped. It didn't take much top coat to encapsulate the pieces, which was nice. I slapped on a crescent moon that I made in a silicone mold, but you can't really tell it's there. I need to work on my skills with that one. But anyway, here it is! Glass nails! Next time, I do it on a dark nail!